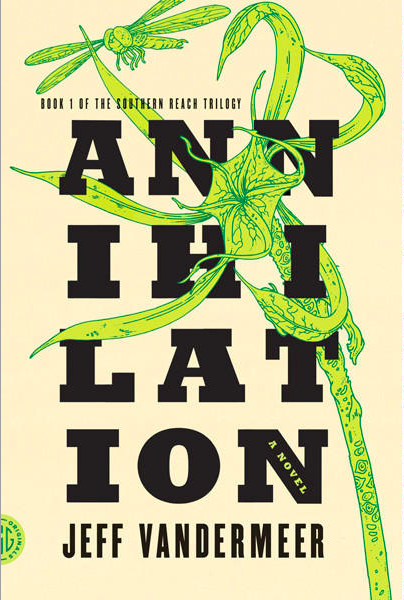 This review is coming several months after I’ve read Annihilation, the first installment ofJeff VanderMeer’s Southern Reach Trilogy, but I thought it was about time I got around to reviewing it. The books in this collection have been getting quite a bit of buzz and has won the 2014 Nebula for Best Novel, the 2014 Shirley Jackson Award for best novel, and was the Sword & Laser book club pick for February of this year. Annihlation is the first in a trilogy about the mysterious Area X, a region that has been quarantined from civilization due to the odd things that keep happening in the area. The only people who enter Area X are the members of occasional expeditions of specialists who are attempting to understand what is creating this strange region. In Annihilation, the expedition consists of four female scientists who are trained in anthropology, biology, psychology, and surveying. The women start the expedition by working together, but, after an odd fungus infects the biologist, the others start to disappear in strange ways. Based off of the description this seems like the sort of book that would be right up my alley – scientists, strange biological beings, mysteries to be solved. Unfortunately, I can’t say that I was very excited by the events of the book. The story is told from the perspective of the biologist, who, despite having recently lost her husband, was not the most exciting character to read about. Her husband had been a member of the previous Area X expedition, but returned to civilization unexpectedly with no memory of his travels, and died shortly thereafter from cancer. These odd series of events happened to every member of his expedition, which should add to the mystery and create suspense for the well being of our current explorers. However, as I felt almost no emotional connection to the biologist, it was difficult to concern myself with her prolonged well being. The biologist is a very stoic character (it has been argued that she may feel so emotionless due to some odd influence from being inside Area X, but she makes enough references to her life outside of Area X that I tend to think it really is just her personality), which makes it difficult to really care about her journey to understand Area X and its connection to her late husband. The book itself isn’t poorly written, and it clearly has done quite well with the critics and on the awards circuit. I just never really connected with it. There was nothing that grabbed my attention, or made me care about the characters or the plot. It was the sort of book I had to force myself to read, and one where I found my attention wandering away from the words on the page as I read it. I wonder if I would have enjoyed it more as an audiobook, though I tend to think I would have just tuned it out if I’d read it that way instead of on paper. Originally, the Southern Reach Trilogy was meant to be published as one novel. As Annihilation is the first book of the trilogy, I had considered that perhaps I would have a greater appreciation for the work if I read the series as a whole. After listening to Tom on the Sword & Laser Podcast, I thought maybe the other two books in the series might be necessary to pull the whole story together, but looking at some of the reviews on Goodreads, I’m not sure that either of the follow-up stories will do that at all. And a lot of the less than favorable reviews are from people who admittedly liked the first book. I’ve gotten a lot of “meh” reports about the series as a whole, and since I wasn’t overly excited by the first novel, I’m having a difficult time finding the motivation to read the other two books. I sort of wish that these books had been published together, because then I would have read the story in its entirety, but, on the other hand, since I didn’t really enjoy this book all that much, perhaps I should be grateful that I only had to read a third of the story? This is one of those books that wasn’t really a bad in any discernible way, yet it was incredibly difficult for me to get through. I suppose it comes down to personal taste; for me to have enjoyed the book I think I either needed a more complex main character, or a more complex plot. The idea of Area X is rather interesting, but the book never made my curiosity about the region strong enough to entice me to read any further than necessary. I don’t want to say that I don’t recommend it – it has won some rather significant awards, so clearly it has some merit in the science fiction genre – but I can’t say that it was a great read for me. It is, however, a rather short novel on its own, so if you are curious it isn’t too much of a time investment to give it a try.